The Firebase Remote Config Android quickstart app demonstrates using Remote Config to define user-facing text in an Android app. This is a simple example of using Remote Config to override in-app default values by defining service-side parameter values in the Firebase console. This example demonstrates a small subset of the capilities of Firebase Remote Config. To learn more about how you can use Firebase Remote Config in your app, see Firebase Remote Config Introduction. Run the sample on an Android device or emulator. In-app default values are set using an XML file in this example, but you can also set in-app default values inline using other setDefault methods of the FirebaseRemoteConfig class. Then, you can override only those values that you need to change from the Firebase console. This lets you use Remote Config for any default value that you might want to override in the future, without the need to set all of those values in the Firebase console. The parameter passed to fetch(long minFetchInterval). The minimum fetch interval set in Remote Config settings. The default minimum fetch interval, 12 hours. Fetched values are immediately activated when retrieved using fetchAndActivate. fetchAndActivate returns true if the final set of key/value pairs now available to the application is different to the set before calling fetchAndActivate, false is returned otherwise. In the quickstart sample app, you call fetchAndActivate from the UI by tapping Fetch Remote Config. 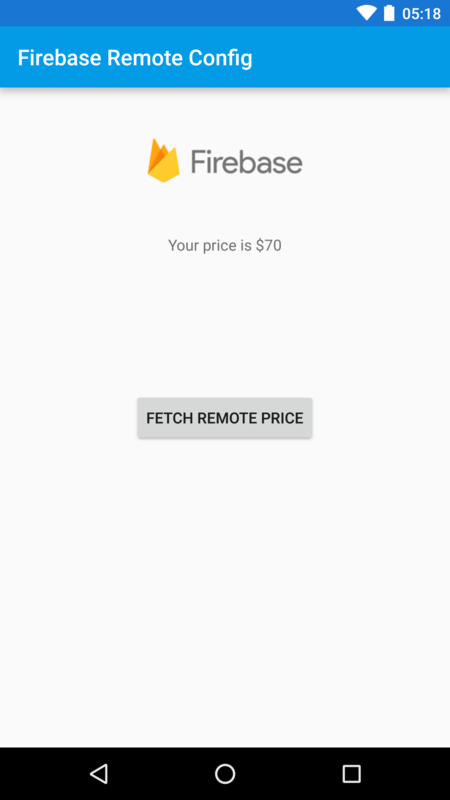 To control when fetched values are activated and available to your app use fetch, the values are locally stored, but not immediately activated. To activate fetched values so that they take effect, call the activate method.